ICE Bursaries for Heron Bros' Apprentices ﻿ | Building, Construction, Engineering & Property Development | Heron Bros Ltd.
Two of Heron Bros’ apprentice engineers have been awarded bursaries from The Institute of Civil Engineers (ICE) at South West College event. 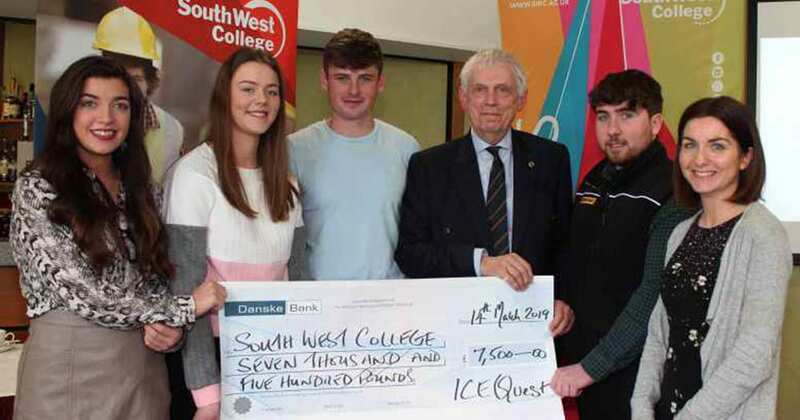 South West College curriculum manager Dr Danielle McKelvey and William Young from Institute of Civil Engineers presented students Annie Crozier, Patrick McElhatton, Matthew Loughran and Orla Coyle with a combined award of £7,500 towards their studies. Pictured at an awards event at South West College for students on its construction and engineering programmes are Institute of Civil Engineers Quest Technician Scholarship recipients for 2018/19. The are, from left, Orla Coyle, Annie Crozier, Patrick McElhatton, William Young, Civil Engineering project officer at South West College, Matthew Loughran and Danielle McKelvey.